The little-known story behind the creation of "Winnie-the-Pooh." In 2011, Winnie the Pooh was voted onto the list of icons of England, and in 2014, a British poll named "Winnie-the-Pooh" the favorite children's book of the last 150 years. And yet little is known about its creator, A.A. Milne or the inspiration for the book that went on to become one of the most beloved childrens' books series of all time. 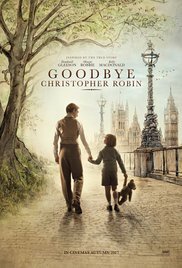 This film shows how the book came to be and sheds particular light on one of its main characters, young Christopher Robin (Will Tilston). Alan Milne (Domhnall Gleeson) was already a successful author when he returned from serving in WW I. He and his wife, Daphne (Margot Robbie), were the toast of London and enjoyed the perks of fame and society. But he came back from the War with a bad case of PTSD, though it wasn't called that then. Shell-shocked was the term but same thing. If a balloon popped or a car back-fired, Milne was transported back to the horrors of war. In the meantime, Daphne and Alan had a son, something Daphne wasn't too thrilled about. She didn't particularly care about giving birth nor did she want a son. She wanted a daughter. After all, she had purchased all of those pretty frocks. More importantly, though, she never wanted to have to send her son off to war and wait for him to come back as she had with Milne. But no matter. The upper classes in Britain then didn't particularly live their lives around their children as we all do today. In fact, a child was almost an afterthought, someone to have a bit of fun with but then trot off to the nanny. So Olive, the nanny (Kelly MacDonald), who Billy dubbed Neu (again, not sure where the nickname came from) was hired and she and baby Christopher Robin lived happily together while Mummy and Daddy traveled and partied. Occasionally, Mummy would surprise Christopher with stuffed animals so he had a bear named Edward, a stuffed donkey and a tiger to keep him company. See where this is going? For some reason unexplained, Milne was called Blue, not only by Daphne but by Christopher Robin as well. Christopher Robin was dubbed Billy Moon. Not sure why they called him Billy, either, but the Moon part came from him not being able to pronounce Milne. The British seem to like nicknames. As Billy grew, so did Milne's PTSD and his writing faltered. He decided he no longer wanted to write frivolous fun but something serious about the horrors of war. He also decided he needed to get out London where the noise reminded him of the war, so the family and the nanny moved to the Ashdown Forest to a lovely 100 acre estate where Milne could wander in blissful silence. One day while out on a walk, Milne discovered that young Billy was following him. Irritated at first because he liked wandering the forest alone and because, frankly, he didn't spend much time with his son, he softened when Billy helped him through one of his episodes. Bees were buzzing and the sound took Milne back to the War where blowflies buzzed over the dead, but Billy, sensitive to his Dad's issues, explained that the sound was just honey bees buzzing around their honey. That was the first step in father and son finding each other. However, Daphne hated being out in the country where little was going on and hated it even more that Alan wasn't able to write thus limiting her social obligations. She hated it so much that she decided to move back to London for awhile until Alan got himself together. Coincidentally, Neu's mother was ill and she also left, leaving Milne to care for Billy by himself. After some awkward conversations as the two got to know each other over breakfast, a breakfast where Milne realized he had no idea what his own little son liked to eat, the two began to bond over tea parties with the stuffed animals and walks with Billy and his stuffed bear. One day Billy came into Milne's study and asked him to write a book for him. Milne, inspired by the tea parties and the walks with the stuffed bear, dashed off a little poem that Daphne got published and thus, Winnie-the-Pooh was born. But the film doesn't stop there. This film is less about Pooh and more about the price of fame and the toll it took upon a young boy. As Milne wrote more books featuring Winnie the Pooh, Tigger, Eyore and young Christopher Robin, and when it was discovered that there was a real Christopher Robin, everyone wanted to meet him. Hundreds of fan letters arrived and Christopher's days were filled with teas and parties with important dignitaries. Now he was a little character himself to be trotted out to perform and it took a toll on him and his relationship with his parents. When what he had done to Billy finally dawned on Milne, he vowed he would never write any more books about him and his bear and he didn't. He also sent Christopher Robin him off to boarding school thinking he was sheltering him from the glare of celebrity, but as with many young boys, especially someone like Billy, he was bullied at school and his life was a misery so when he came of age and had the opportunity to join the military and serve in WW II he took it. Daphne's lifelong nightmare had come true. And more nightmare was to come. Older Billy had some issues about all of those Winnie the Pooh books and took the opportunity to tell his Dad just how miserable his books had made him. "I asked you to write a book for me, not about me!" This is the story of the creation of Winnie the Pooh but it's also a story of the price of fame and lost innocence. Bring your hankies. Now I am going to take a moment to say something you would probably never think I would ever say. I have fallen in love with a child actor. I know that I have softened my stance on child actors lately because I liked the kids in "It" and that young actor, Iain Armitage, who starred in "Our Souls at Night" and "Big Little Lies." I have come to realize it's not the kid actors that are obnoxious so much as it's the writers giving those kid actors obnoxious things to say. Here I give credit to screenwriters Frank Cotrell Boyce and Simon Vaughn for writing a believable character who doesn't rattle off precocious comments to get a laugh and make us go awww. Usually when that happens I go yuk. But I also have to give young Will Tilston props for making eight-year-old Christopher Robin come to life. He is so damn cute I could hardly stand it and an amazing young actor. I was thinking while watching him that he could very well get an Academy Award nomination for Best Support Actor. I mean Tatum O'Neal was only ten when she won hers. But I hope that doesn't happen. I totally do not believe in giving Oscars to children. No matter how good their performances are, they need to pay their dues. so though I am softening my stance on child actors, I won't go that far. No Oscars should go to anyone under 25! I could do a whole rant on that...but I won't. Director Simon Curtis presents a beautiful golden world with the help of cinematographer Ben Smithard where the fictional Winnie the Pooh was born, but also the darker real life world of the creator and his son, Christopher Robin. I am a huge fan of Domhnall Gleeson, though he seemed a bit young for the older Milne, and you may recognize Kelly MacDonald from "Boardwalk Empire." She is a lovely actress. Margot Robbie does a good job of playing Daphne, who is really a bit of a cold fish. She didn't want Alan to come in to see her after giving birth because she didn't want him to see her blubbering and in fact no blubbering was allowed by anyone in the house. Rosy the Reviewer says...I loved this film. I loved this film so much I cried. No, actually I blubbered. Sorry, Daphne. When her car breaks down at a wealthy client's home, a holistic medicine practitioner is invited to attend an important dinner party and very early it becomes clear that she is a fish out of water. Beatriz (Salma Hayek) is a hard-working holistic medicine practitioner working at a cancer clinic and living in L.A. After driving down to Newport Beach to attend to one of her wealthy clients, when she is ready to leave, her car won't start. Kathy (Connie Britton), her client, invites her to stay for dinner, a dinner that is actually an important one for Kathy and her husband, Grant (David Warshovsky). They are entertaining Doug Strutt (John Lithgow), a billionaire developer whom they want to impress because, well, he's Grant's boss. They and some other invited guests are all celebrating a successful business deal and everyone is gushing over Doug, laughing at his jokes and agreeing with everything he says. Unfortunately, as they say, no good deed goes unpunished. Kathy didn't know what she was doing by inviting Beatriz to dinner. You see, Beatriz is very New Age. She's warm, a hugger and she's a liberal. She is also a Mexican immigrant who is clearly not in the same economic bracket as her dinner mates and it isn't long before she can clearly see through the bull that is being thrown around at dinner where everyone is bragging about their wealth, how they were able to bypass regulations, and play the system in order to make money. And Doug is a very uptight privileged bragging egotist who lacks self awareness and is very right wing (sound familiar)? Beatriz doesn't know how to play the game and frankly, she doesn't want to. Her presence challenges the conscience of the social order. She is the eyes and ears of the little people who aren't supposed to know what the 1% are up to. 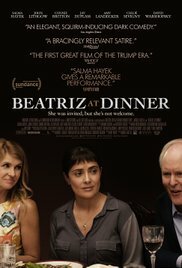 First, Beatriz is basically ignored as the dinner progresses so, even though she doesn't usually drink, she helps herself to some wine. And then more wine. The guests are mostly chatting about clothes, money and gossiping about celebrities. When Beatriz is brought into the conversation she talks about spirituality and saving the earth. Uh...awkward. And when she challenges Doug's ethics about some stuff he is doing in Mexico, things start to take a turn. These people are not used to being challenged. Turns out Doug is also a big game hunter and brags about his kills, showing pictures to the group. Everyone is very impressed. Everyone except Beatriz. She calls it disgusting and storms out of the room. Kathy follows her. She isn't mad especially when Beatriz apologizes and tells her about her bad week. She works with dying kids, which takes a toll on her and one of her pet goats has died. So Kathy tells her to go to bed. Beatriz goes off to a bedroom but not before she sneaks a bottle of wine and smokes a doobie (she's on a roll now) and decides to do a little research on Doug on the computer. Turns out Doug is even worse than he seemed at dinner. So Beatriz goes back downstairs. Ruh-roh. Directed by Miguel Arteta with a screenplay by Mike White, this film explores the cultural gap that exists between the rich and the poor, between Americans and immigrants from other countries, especially less prosperous countries. Kathy says to Beatriz, "I feel like I don't know you," to which Beatriz replies, "You don't know me." Kathy thinks that she knows Beatriz because she meets with her regularly as a client and even introduced Beatriz to the dinner guests as a "friend of the family," because Beatriz had helped them through a cancer scare, but Kathy doesn't know anything about her. She never made the effort to go further than their client-caregiver relationship. Well-meaning people can sometimes be the worst because they think that being nice gives them a pass for the rest of their lives and the rest of the things they do. Think about people who feel good about themselves for delivering Thanksgiving dinners to the needy on Thanksgiving but never "dirty their hands" the rest of the year or find out anything about the people they are helping. I talked about how much I admire Salma Hayek in my review of "How To Be a Latin Lover." My admiration stems from the fact that she chooses important projects that try to make a statement even when they might be small projects with small roles for her as in "Latin Lover," or a less glamorous role where she eschews make up to play a regular, hard-working woman as she does here. This film is clearly Hayak's movie, make-up or no make-up. She is mesmerizing, and she is not only an amazing actress, she is an amazing woman. Rosy the Reviewer says...an enjoyable but also important satire on our world today. With the talent behind Dana Carvey's 1996 TV sketch comedy series, "The Dana Carvey Show," how could it possibly have failed? Well, it did, and this feature length documentary now streaming on Hulu is a testament to the fact that no matter how much talent there is behind a project, there is no guarantee it will resonate with the American public. 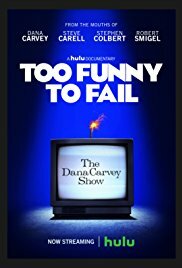 The failure of "The Dana Carvey Show" was one of the most spectacular failures in TV history despite the great comic minds involved. I remember watching that show because I was a big Dana Carvey fan and f you watched "Saturday Night Live" back then, you probably were too. Who wasn't a fan of The Church Lady, or of his George H.W. Bush impersonation, or of Wayne and Garth? But watching his show I had no idea that his writers and other cast members included Stephen Colbert, Steve Carell, Robert Smigel and Louis C.K. Smigel had been one of the writers on SNL and left when Dana did. Carell and Colbert were both at Second City and were recruited along with Louis C.K. who was going to be the head writer. Robert Carlock and Charlie Kaufman rounded out the group. So with all of that talent, what could go wrong? They all wanted to do "edgy topical comedy," like Monty Python, and because of that, Dana thought they would do better on HBO, but since HBO wasn't the behemoth it is today he was talked out of it. So it was going to be on ABC during primetime following "Home Improvement." What better position could they be in? What a mistake! ABC thought they were getting The Church Lady and other characters that Dana had created on SNL. Instead they got "Stupid Pranksters,"
and "Waiters who are Nauseated by Food." But there were other edgier sketches: "Skinheads from Maine" and "Grandma the Clown," where the clown really was an old lady who couldn't do tricks very fast, she did them very, very slow---ly. It was all just too much for middle America after watching the homespun "Home Improvement." I thought these sketches were really funny and I liked the show, but I don't think I am your typical American TV viewer nor do I have a typical sense of humor. I like edgy. Anyway to make matters worse, right after the show was given the green light, Disney bought ABC. The show failed within the first five minutes of its first show with a sketch about the nurturing nature of President Clinton, showing him with multiple breasts, breastfeeding a bunch of babies. 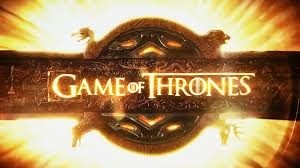 Six million people deserted the show in the first five minutes and the next day the reviews were savage and the show lasted a mere seven more episodes. Steve Carell talks about getting one fan letter for the show and then recognized the handwriting as his mother's. Robert Smigel remembers creating the Ambiguously Gay Duo with Colbert and Carell as the voices of Ace and Gary. Colbert relates that he thought he would never work again. Dana told the cast and writers he was sorry for ruining their careers. Written and directed by Josh Greenbaum, this movie attempts to figure it out. It's not entirely successful, but it does show that no matter how much talent is attached to a project one can never completely gauge the taste of the American public. Was Carvey, who is one of those comedians who is always on, be just too much for primetime TV? Was the comedy too out there for a 1990's American public? But to be frank, I don't think these guys were really into pleasing anyone but themselves. They had a vision and they went with it. And that vision failed. Robert Carlock has since written some hugely successful TV shows and Charlie Kaufman went on to write the screenplay for "Eternal Sunshine of the Spotless Mind." The sketch with Colbert and Carell as the nauseated waiters led to both of them becoming a part of "The Daily Show" and we all know how their careers went after that! Likewise Louis C.K. went on to comedy stand-up greatness and his own TV show. Smigle's "Ambigulously Gay Duo" became a big hit later on SNL and he invented Triumph, the Insult Comic Dog. And Dana? Well he is still Dana Carvey. He tours the country with his one man show and has appeared in films and continues to be over-the-top. Rosy the Reviewer says...a fascinating look into television history and the early careers of some of today's biggest talents. A young woman searches New York City for her missing sister and uncovers a satanic cult. I didn't know that devil worship was a thing in the 1940's. 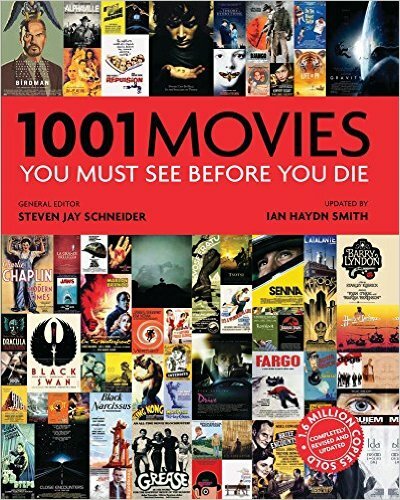 I learn something every day watching movies. Mary Gibson (Kim Hunter) is at boarding school when she is called into the office by the principal and told that her tuition has not been paid by her sister, Jacqueline (Jean Brooks), who is her guardian, and no one has heard from her in over six months. Worried, Mary decides that she must take leave of the school and go search for her sister. As she gets ready to leave, the principal's assistant takes her aside and tells her not to come back. It's nothing ominous. She is basically telling her if she comes back she might never get out of there, just like her, and thus become a spinster. Another thing about the 40's - a great fear of ending up a spinster. They all work together to find Jacqueline, who it turns out has gotten herself involved with a bunch of Satanists who want to kill her for revealing their existence. Directed by Mark Robson and starring a very young Kim Hunter in her first film role, Hunter went on to win a Best Supporting Actress Academy Award in 1952 for her role as Stella in "A Streetcar Named Desire," but as happens to so many actors and actresses, despite bursts of promise and fame such as an Oscar, Hunter never really gained superstardom. After that Oscar, her career was mostly guest appearances on TV dramas and recurring roles in soap operas. Why it's a Must See: "Perhaps the best of the run of terrific RKO horror films produced by Val Lewton in the 1940s. [This film] is a strikingly modern, poetically doom-laden picture...full of things that must have been startling in 1943 and are still unusual now: a gaggle of varied lesbian characters...[and] a heroine who comes to seem as calculating as the villains..."
Yes, that's true along with absolutely atrocious dialogue and major over-acting. I also take issue with this one actually being labeled a horror film. 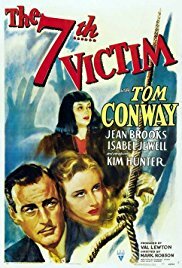 But Val Lewton produced this one, and he's the guy responsible for such horror classics as "I Walked with a Zombie" and "The Cat People (the 1942 version, not the 1982 remake)," and when I say classics, I mean the cult variety. But the film is strangely hypnotic, and I could see some possible influences that turned up in "Psycho (there's a similar shower scene)" and "Rosemary's Baby." That said, I have to digress for a moment. I feel a rant coming on. There is a scene that made my librarian blood boil. Grant goes to the library to find out what books two suspects had read and the librarian cheerfully, not only gives him the titles, but hands over the books. Now people, I want to assure you that would never happen today. Libraries protect your right to read and your right to privacy so do not let this film undermine your feelings about the integrity of libraries and librarians. No librarian will tell anyone what you are reading unless they present a warrant! There, rant over. Rosy the Reviewer says...some of these older films don't hold up well today and this is no exception, but if you can suspend your disbelief, you can have some campy fun with this one. Make some popcorn and invite some friends over! In the 1920s, after oil was discovered on their land, the richest people per capita in the world were members of the Osage Indian nation in Oklahoma. Then, one by one, the Osage began to be mysteriously killed off. When the white man came, Native Americans were eventually shunted off to parts of the U.S. that white Americans didn't want. Such was the case with the Osage of Oklahoma except they struck oil on their inhospitable land and became rich. White Americans were not happy that the Osage became wealthy, especially since they didn't consider them real Americans nor smart enough to handle their own money. So because of that, the government appointed white guardians to manage the money of many of the wealthy Osage who weren't considered competent, thus setting the stage for a full-blown conspiracy that ended in murder. The family of Mollie Burkhart became a prime target. Her relatives were shot and poisoned. And it was just the beginning, as more and more members of the tribe began to die under mysterious circumstances and those who dared investigate the killings were also killed. As the death toll climbed to more than twenty-four known cases, the FBI took up the case. The FBI was new to the murder investigation and so the young director, J. Edgar Hoover, turned to agent and former Texas Ranger, Tom White, to help unravel the mystery and together with one of the only American Indian agents in the bureau, the agents exposed one of the most chilling conspiracies in American history. Their investigation has so many twists and turns, this book reads like a mystery novel, yet it's all true and like any great true crime book, the truth is stranger than fiction. 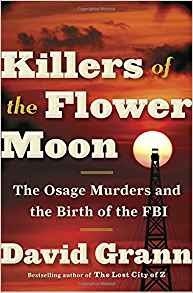 Meticulously researched, Grann has uncovered new evidence and believes that hundreds of Osage died as part of this conspiracy, not just the known 24, and that the extent of the conspiracy and much of the mystery will never be solved. "In cases where perpetrators of crimes against humanity elude justice in their time, history can often provide at least some final accounting, forensically documenting the murders and exposing the transgressors. Yet so many of the murders of the Osage were so well concealed that such an outcome is no longer possible. In most cases, the families of the victims have no sense of resolution. Many descendants carry out their own private investigations, which have no end. They live with doubts, suspecting dead relatives or old family friends or guardians -- some of whom might be guilty and some of whom might be innocent." I am mad because of what Native Americans have had to endure, the brutal prejudice that existed against Native Americans and which still probably exists today, and the crimes against them that many white men perpetrated. And this book made me mad because the Osage were not only treated like second-class citizens but callously murdered so white men could take over their land rights. I feel the same way when I see movies and read books about the Holocaust and about slavery. I get really, really mad and ashamed that humans can treat other humans so badly. And yet I read and I watch because we must never forget our shameful past so that we never repeat it. Rosy the Reviewer says...this is a true crime story, but it's also a history of the FBI and sheds light on a shameful part of America's past.